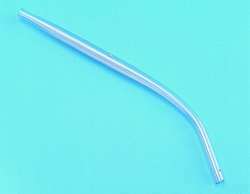 a rigid hollow tube made of metal or disposable plastic with a curve at the distal end to facilitate the removal of thick pharyngeal secretions during oral pharyngeal suctioning. A form of rigid catheter. A rigid suction tip used to aspirate secretions from the oropharynx.